On February 12, 1950, Buffalo socialite Marion Little Frisbee* was discovered in a frozen ditch in a suburb 12 miles outside the city, a .32-20 rifle bullet through her left temple. Within 24 hours, a 19-year-old Native American** youth named Harley LaMarr had been caught at a boarding-house and copped to the crime. While the coroner did report an “attempt at criminal assault,” the motive for Frisbee’s abduction/murder had been robbery. Harley LaMarr needed money because his mother, Amelia Palwodzinski, had had a fight with her second husband the month before. In the course of that fight, she planted a butcher’s knife in the man’s chest. As Amelia went off to serve a 30-year stretch for manslaughter, she made her boy Harley promise to give the victim a decent burial. Harley had no money: he did have a .32-20. He took it to a tony part of town and waited for an opportunity. Marion Frisbee’s purse netted him about $6. He didn’t bother taking her diamond ring because, he said, he just wanted cash for the funeral. Harley insisted the gun went off by accident: the jury in a four-day trial that April didn’t buy it. The day before Harley LaMarr’s electrocution at Sing Sing on January 11, 1951, the Empire State’s prison officers brought his mother from Bedford Hills a few miles down the road to death row for one last goodbye with her tragically dutiful son. The youth met with his mother for 20 minutes after authorities brought her from Bedford Hills. They spoke together in low tones. The woman took a long last look at her son and walked away from the visiting cage dry-eyed. * No relation to the flying-disc fortune; that “Frisbee” was only trademarked in 1958. Marion Frisbee was just the wife of a local salesman with the Queen City Pure Water Company. ** Amelia was white; Harley’s father was Native American. 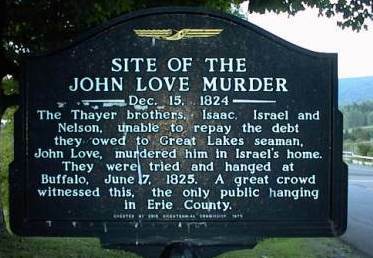 On this date in 1872, Buffalo sheriff — and future U.S. President — Grover Cleveland personally sprang the trap to hang matricide Patrick Morrissey. 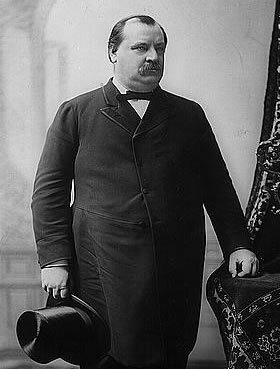 Grover Cleveland hanged convicts on two non-consecutive occasions. Cleveland had taken office as Erie County sheriff the year before, his stepping stone from a legal practice into an illustrious electoral career in the Democratic Party that would see him rise to Mayor of Buffalo and Governor of New York (and, after his death, to the $20 bill). 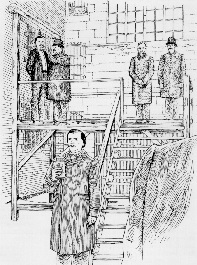 One of Cleveland’s duties as sheriff was to carry out death sentences; he declined to delegate the responsibility to one of his assistants — the hagiography says that his ethical rectitude compelled him to assume the weighty responsibility personally — and handled Morrissey’s dispatch with his own hands. With his subsequent ascent in the political realm, Cleveland’s activities this day made him the rare notable executioner to earn his fame in another walk of life. Or infamy, as the case may be. 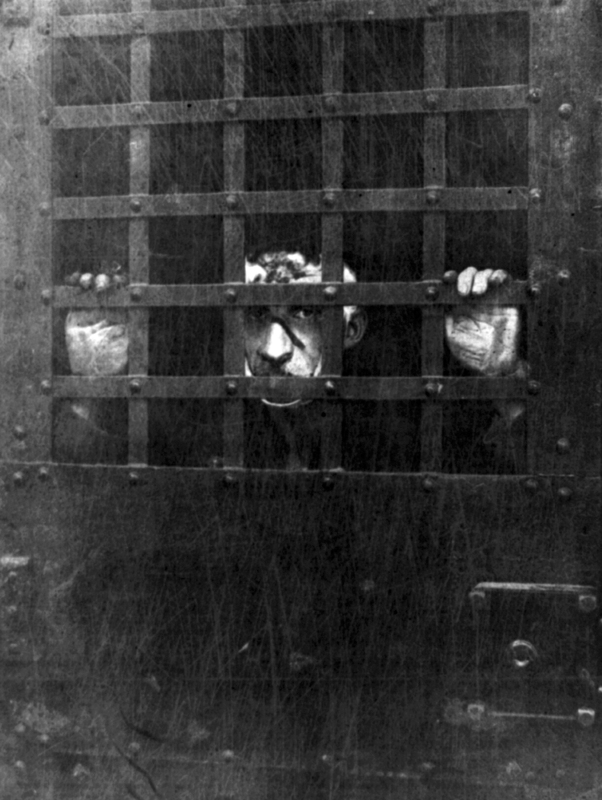 In an era of competitive sloganeering and sobriquets,** Cleveland’s Republican opponents tried to hang him — so to speak — with the nickname “The Buffalo Hangman”. 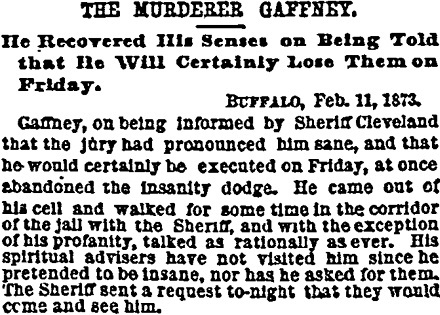 * The other death row murderer referenced in the Times story was Cleveland’s second (and last) execution on February 14, 1873. ** Like most presidential pols of the time, Cleveland had many more nicknames, both friendly and not — “Uncle Jumbo” because of his girth; “Old Veto” for his liberal use of executive power; and others. (He was also elected a bachelor and married a 22-year-old beauty while in office. Eat your heart out, Bill Clinton.) The New Yorker avers that Buffalo voters during Cleveland’s early local incarnation actually knew him by the avuncular-yet-unwholesome handle of “Big Steve”.